If you are thinking of buying a new Reliance JioFi Dongle, this is the right time to do so. Reliance Jio has introduced a new 100% Cashback Offer for prospective JioFi Dongle customers starting 29th June, 2017. Under the latest JioFi Cashback Offer, Reliance Jio is offering Unlimited Calling and Data worth Rs. 1999 on purchase of Reliance JioFi Dongle worth the same price i.e. Rs. 1999. 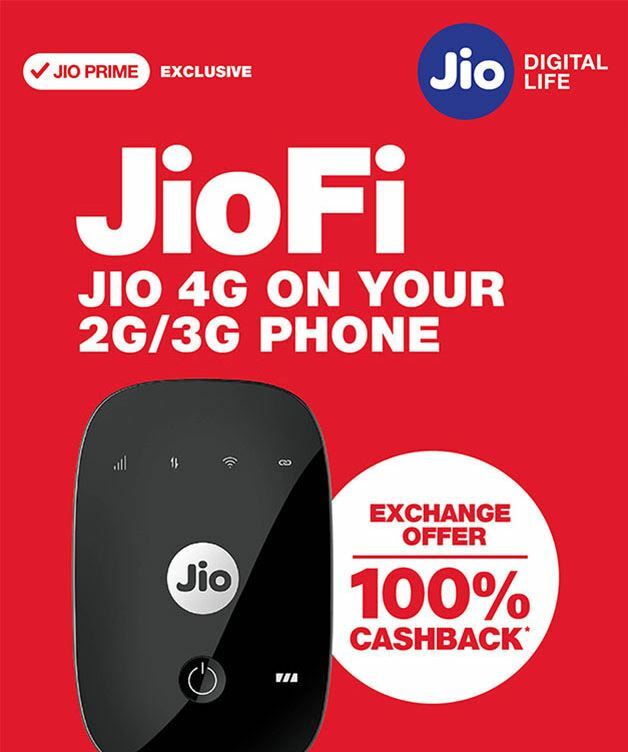 The JioFi Cashback Offer is also updated on Reliance Jio website as well, you can visit it and confirm the same but read this article completely to know all details. You need to visit the Reliance Jio Store or any store selling the JioFi Dongle and pay Rs. 1999 to get the Reliance JioFi Dongle. After purchasing the JioFi device, the customer need to complete the necessary CAF or eKYC formalities & obtain a Jio SIM. Upon successfully obtaining the Jio SIM, you would get 4 options to choose from Rs. 149 Plan, Rs. 309 Plan, Rs. 509 Plan & Rs. 999 Plan. If you choose Rs. 149 Plan, you would get Unlimited Voice calls with 2GB data per day & 300 SMS for 12 recharge cycles. Yes, you will get the freebies as mentioned earlier for 12 cycles i.e. you will get Rs. 149 X 12 months (28 days) for Free. If you choose Rs. 309 Plan, you would get Unlimited Voice calls with 1GB data/day & 100 SMS/day for 6 recharge cycles. Yes, you will get Rs. 309 X 6 months (28 days) for Free. If you choose Rs. 509 Plan, you would get Unlimited Voice calls with 2GB data/day & 100 SMS/day for 4 recharge cycles. Yes, you will get Rs. 509 X 4 months (28 days) for Free. And lastly, if you choose Rs. 999 Plan, you would get Unlimited Voice calls with 60 GB data & 100 SMS/day for 2 recharge cycles. Yes, you will get Rs. 999 X 4 months (60 days) for Free. Other Terms & Conditions state that the benefits are non-transferable, available for Prepaid users only, offer available only for New Product and New Jio SIM and the above mentioned plans are not available for existing Prepaid customers. You can read all T&C on this page. What should the existing JioFi customers do? If you are an existing JioFi customer, you might be tempted to buy new JioFi Dongle to avail the 100% Cashback Offer on JioFi Dongle. But wait, you will have to spend Rs. 1999 and if you avail any of the above mentioned plans you will have to recharge for the same amount on your existing JioFi dongle. For instance, you want to buy JioFi Dongle with Rs. 309 Plan which will give you Unlimited Voice calls with 1GB data/day & 100 SMS/day for 6 month (a month in India is 28 days), you will spend Rs. 1999 on the new device. You can recharge with Rs. 309 on your existing device and get the same benefits on your existing device and you will also save around Rs. 150. Here is how, Rs. 309 X 6 = Rs. 1854 which is less than Rs. 1999. Similarly, for Rs. 149 Plan you can save some amount as well by continuing with existing dongle. Here is how, Rs. 149 X 12 = Rs. 1788, around Rs. 211 less than Rs. 1999 you are tempted to spend on a new dongle. For Plan 509 and Plan 999, you will end up paying exactly the same amount. So if your JioFi Dongle is working absolutely fine & your usage is not beyond 1GB per day, we would suggest recharging your existing Dongle and not going for a new Dongle under JioFi Cashback Offer for July 2017. What happened to JioFi Dongle Exhange Cashback Offer? 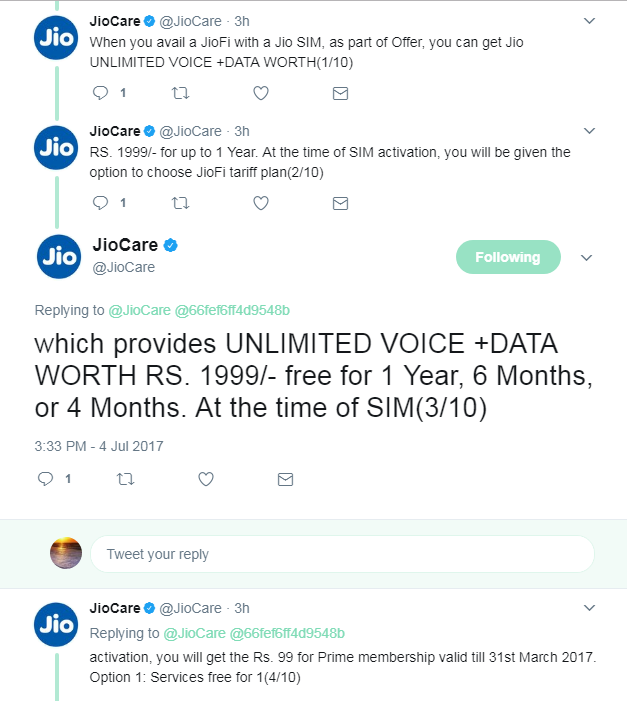 It has officially ended in June, 2017 only and no such offer is available and only the JioFi Cashback Offer as discussed above is available now.